Please pre-book this tour at the City Cruise kiosk at Tower Millennium pier. Please arrive 15 minutes earlier to board. Collection Information Please pre-book this tour at the City Cruise kiosk at Tower Millennium pier. What better way could there be to begin a great evening out with friends than with a leisurely cruise on the Thames as the sun goes down? On board the Evening Cruise you’ll enjoy live music, an ice cold glass of fizz and some snacks to get you in the mood for a night on the town or just enjoy the spectacular view of London like never before. 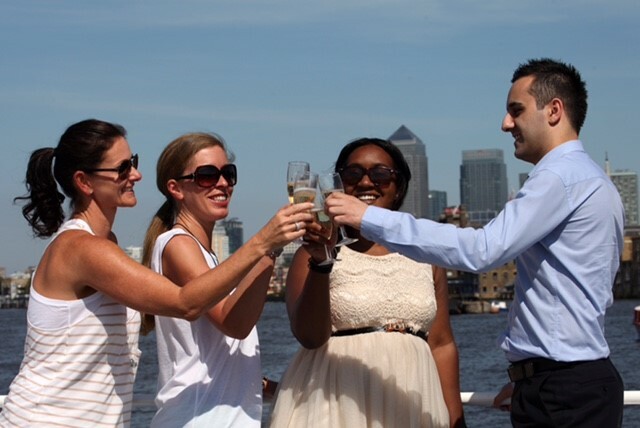 Boarding the Evening Cruise, you will be presented with a fresh glass of bubbly to enjoy while you take in the sights along the banks of the Thames as the sun slowly sinks. While you relax, a live musician will provide the ideal sound backdrop for all the visual splendour that London offers from a riverside seat on the Thames. The Evening Cruise also operates during the winter months and follows the same route of the Thames taking in the floodlit attractions along the way. It’s up to you whether you choose a bracing stroll on the open-air upstairs deck, or luxuriate in the views from the lounge with a drink from the fully stocked bar and a canapé in hand. Along the way you’ll take in many of London’s most historic landmarks, including Westminster Bridge, the Houses of Parliament, Big Ben and the Palace of Westminster - to name just a few. Departing from Westminster Pier, the Evening cruise operates from 9th May until 10th September daily, while it runs from 13th September, Wednesday to Sunday during the winter months. Westminster Pier is situated next to Westminster Bridge and easily accessed from the London Underground at Westminster station which connects with the District, Jubilee and Circle lines. This is an adults-only cruise departing at 6.30pm during the summer months and arriving back at Tower Millennium Pier at 8.30pm. Passengers are asked to arrive 15 minutes before departure time. Sparkling wine and finger food is included in the ticket price. Vegetarians can be catered for if specified at the time of booking. The Evening Cruise is a social event, so there is no guide on hand. However, chatting to your fellow passengers is an excellent way to share information and meet new friends. Be aware that, currently, there is no wheelchair access on this cruise. The nearest tube station is Tower Hill, accessible via the District and Circle Line.